We’re thrilled to announce that our 360/VR film SILENT RESONANCE has been chosen to screen at the 2017 San Francisco Dance Film Festival. The first virtual reality experience from Pacific Northwest Ballet, SILENT RESONANCE features dancers Emma Love Suddarth and Miles Pertl performing stunning duets. PNB Company dancer Price Suddarth choreographed the piece with the concept of VR’s immersivity in mind: his work seeks to bring the viewer into the mind of a dancer. SILENT RESONANCE was directed by our Creative Director, Scott Squires, and produced by Aaron Rhodes and Julia Fryett. The 2017 San Francisco Dance Film Festival takes place October 19–22 at the Brava Theater Center. 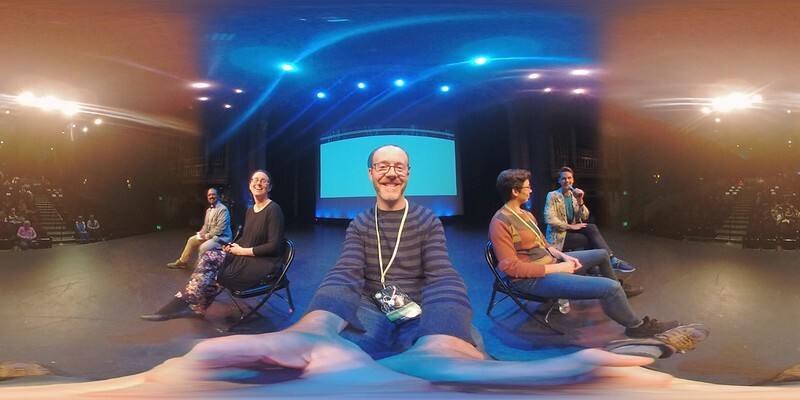 Join Pixvana’s Executive Producer for a panel discussion on dance and virtual reality. Aaron will speak alongside animator Cecilia Sweet-Coll, filmmaker and former classical ballet dancer Luke Willis, and co-moderators Bhautik Joshi and Elly Nattinger. Panelists will touch on the history of immersive media and discuss the challenges and future possibilities of capturing dance in virtual reality, asking how VR filmmakers should approach guiding viewers in 360 degrees. Sunday, October 22, from 2:00 PM – 3:30 PM at Brava Theater Center, 2781 24th Street, San Francisco. In addition to streaming SILENT RESONANCE on Youtube and Facebook 360, you can view our Pixvana 360 Production Series for free in the Steam store using a Vive, Rift, or OSVR headset.